If you think about it, the way we load and unload planes with passengers (or, in airline terminology, ambulatory waste-producing cargo) is wildly inefficient. Slow, shuffling, cranky lines of people slowly filing into seats while the plane is stuck there—isn’t there a better way? 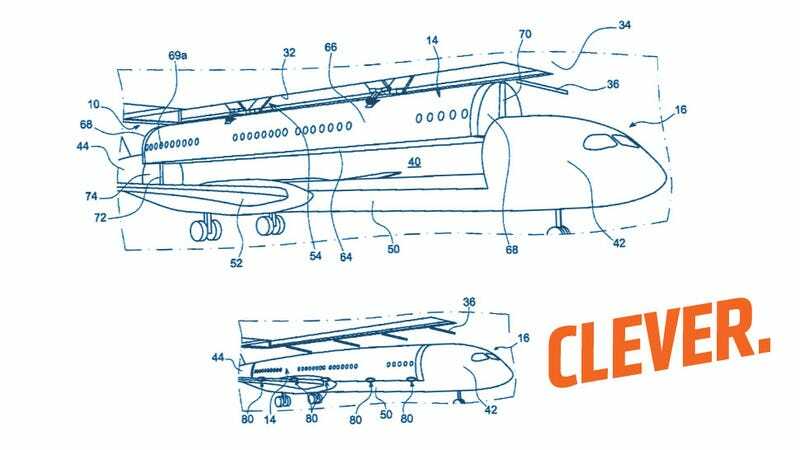 Airbus thinks so, and has the patent to prove it. The idea is really quite simple: separate the passenger compartment from the rest of the plane. By having swappable, removable cabins, passengers could be loaded while still at the gate, and when the plane lands, the incoming passenger pod could be swapped with the outgoing one, and the plane would be good to go. Well, after routine servicing, fueling, and luggage/cargo transfer. Still, it would likely be faster. The patent drawings show a long, half-cylindrical cabin with the usual windows and (presumably) interior fittings. It’s not that different than just taking that chunk of the airplane, the top middle passenger section down to the floor that separates the pressurized passenger compartment from the cargo area below, and adding some semicircular bulkheads at the front and rear. It’s not clear from the patents if the module will have any sort of hatch or airlock to access the cockpit. If not, this could be useful for security purposes as well, since there would be almost no way to get from the passenger module into the cockpit to cause havoc. I assume there’s a bathroom in the cabin-module, and there must be fittings for power and plumbing and data, at least. I suspect the removable module would come with some weight penalty, since this does add some extra hardware to a plane. The patent also describes equipment to place and remove the modules, which is a good reminder of why this is unlikely to happen any time soon: the infrastructure requirements would be significant. There’d need to be at least one pilot program airport to try it, and a fleet of cabins and planes would need to be built and proven economically beneficial before any airport would be willing to take such a significant plunge. So don’t hold your breath. Still, it’s an interesting idea. The pods could be easily swapped with cargo modules, too, and possibly—stay with me here—be placed on rail or road chassis to be taken from the airport into a city center, even? Well, if they included a luggage/cargo module as well. Could the planes fly without them? That would be nice and bizarre looking. Could the modules be equipped with large parachutes to let them be ejected safely in case of an emergency? Can I buy a decommissioned one as a house in several decades?